Dental plaque and the viscous brown slime in drainpipes are two familiar examples of bacterial biofilms. Removing such bacterial depositions from surfaces is often very difficult, in part because they are extremely water-repellent. A team of scientists from the Technical University of Munich (TUM) has now been able to show how such biofilms adapt their surface texture to repel water—similar to leaves. Bacteria surround themselves with a shell of self-produced chemical building blocks (polymers) to protect themselves from environmental hazards. The combination of bacteria and the slime they produce is called a biofilm. Microorganisms that form biofilms on surfaces have developed clever strategies that prevent running water from washing them away. This can pose a major problem not only in drainpipes but also on medical implants and tubes. Professor Oliver Lieleg, professor of biomechanics, and his research group "Biological Hydrogels" at the Munich School of BioEngineering are investigating the physical principles that make bacterial biofilms so tough. In a recent study published in the journal NPJ Biofilms and Microbiomes, they precisely measured the surfaces of biofilms using confocal reflection light microscopy. "Our first realization was: not all biofilms are the same—even if they are produced by the same bacterium," Oliver Lieleg says. The researchers found that the soil bacterium Bacillus subtilis can produce biofilms with very different properties: In some instances, water droplets spread almost instantly across the surface. In other cases, they roll off the surface or cling to the surface in the form of spherical beads, even if the surface is tilted vertically. The team showed that the microorganisms employ tricks from the plant world, namely the water-repellent behaviour of the leaves of lotus plants and roses. Lieleg and his team discovered that the surface structure of bacterial films is indeed very similar to those of the plant leaves. Like leaves, biofilms also have rough structures both on the micrometre and the nanometre scale, making them resistant to wetting with water. 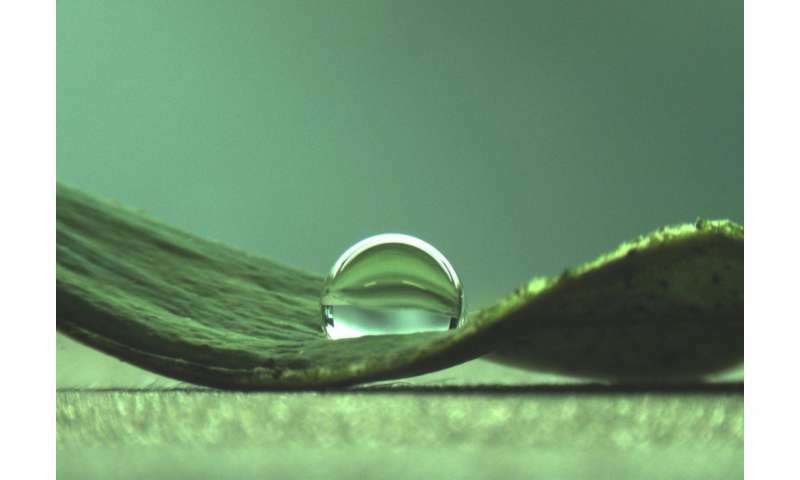 However, plant leaves and biofilms both vary in this respect: when the lotus effect is present, small air bubbles are trapped between the water droplet and the surface of the leaf, whereas this does not occur in the rose petal effect. That is why water droplets roll off lotus leaves but stick to rose petals. Whether a biofilm behaves more like a lotus leaf or a rose petal depends on the nutrients available to the bacteria during growth, as this determines the precise surface structure of the biofilm. Bacteria in biofilms are often difficult to kill with antibiotics and other chemicals. In part, the increasing prevalence of bacterial resistances is to blame for this. The researchers now propose tackling the water-repellent properties of biofilms: "An antibacterial substance cannot work if it is unable to reach the surface of a biofilm because it rolls off. Thus, we need to modify this water-repellent surface texture," Oliver Lieleg explains. "This would be a new approach to the removal of biofilms from surfaces such as tubes, catheters and infected wounds."